Did I say “in bed?” Yep. It’s normally not a good idea to fall asleep when you are doing yoga. You can overstretch your muscles if you fall asleep in a restorative pose, and if you’re practicing conscious relaxation, well, being unconscious pretty much negates the positive effects you’re aiming for. However, there is one exception to this rule of thumb: when you’re lying in bed sleepless due to insomnia. Whether you have trouble falling asleep initially or can’t fall back to sleep after waking in the middle of the night, instead of working on your to-do list—it’s tempting, I know—try a little yoga. There are a number of yoga practices that just might help you relax enough to finally drift off to sleep and/or improve the quality of your sleep. While practicing any of these techniques, be sure to stay warm and keep the lights off to keep stimulation down to a minimum. 1. Breath Awareness: This is the simplest yogic breath practice and one of the most basic forms of meditation. Simply bring your awareness to the sensations of your natural inhalations and exhalations. When you notice your mind wandering to your to-do list or elsewhere, gently return your mind to your breath. 2. Extending Your Exhalation: After observing your natural breath for a few minutes, you can try extending your exhalation (while inhalations are slightly stimulating, exhalations are naturally relaxing). When you reach the end of your exhalation, instead of immediately inhaling, lengthen your exhalation by one or two beats. Keep it relaxed, and if at any point you find the practice irritating, return to your natural breath. 3. Silently Reciting a Mantra: Just as you would when you are meditating, you can use a silent mantra, or any word or phrase, in bed to keep your mind from drifting into anxious thoughts. This is helpful for those of you who don’t find focusing on the breath effective (or when you have a cold!). When you notice your mind wandering from your mantra to your to-do list or elsewhere, gently return your mind to your mantra. 4. Guided Relaxation: Following the instructions for a guided physical relaxation, with or without earphones, allows you to focus your mind on a soothing voice and your physical sensations, enabling some people to drift off to sleep. 5. Self-Guided Relaxation: When you are familiar with the basic instructions for deep physical relaxation, it’s simple enough to skip the relaxation track and just gradually relax your body by following your own instructions. Many years ago, my first yoga teacher recommended this as an insomnia practice. 6. Slight Inversion: This is a form of Supported Setu Bandha Sarvangasana (Supported Bridge Pose), with a bolster or pillow under the pelvis instead of a block. If you have a bolster, you can keep it near your bed and just slip it under your pelvis whenever you like, either at the beginning of the night or in the middle of the night. If you don’t have a bolster, you can just use bed pillows! Slide onto the bolster crosswise under your pelvis and release down onto it, making sure the entire bolster is below your waist and is not supporting the curve of your lower back. If necessary, move it to a better position. As you relax in the pose, allow your knees to fall toward each other, rather than further apart. Because this pose takes advantage of the way your body regulates blood pressure, it is automatically calming. If it’s comfortable for you, you should try to stay at least 10 minutes because it takes a while for the relaxation response to take full effect. Practicing this pose before sleep or in the middle of the night might help you fall asleep more quickly and/or sleep more soundly. But even if it doesn’t, you will still reap all the benefits of conscious relaxation. In this state, your body reduces stress hormones, slows your heart rate, decreases blood pressure, allows your digestive, healing, and immune systems to function optimally, and quiets a racing mind. So it’s all good! 7. Supported Forward Bend: If you sleep alone or aren’t worried about disturbing your partner and you find forward bends soothing, you could try a supported forward bend in your bed. Sit with your legs straight or in cross-legged position (whichever is more comfortable and allows a deeper forward bend). Place a stack of pillows on top of your straight legs or in front of your crossed legs. Lengthen your spine forward and rest your forehead and arms on the pillow and relax. Try to stay at least three minutes. If you can’t get comfortable in the pose, then this one isn’t for you. If you suffer from insomnia, I sincerely hope you’ll find something on this list that will help. Most of these are techniques I’ve found useful myself (I’m a bit too lazy to sit up and try an actual pose, however). Want to understand more about the importance of good sleep? Read this article from YogaUOnline and Ram Rao, Ph.D.- Rebooting Your Brain: Reset Your Nervous System with a Good Dose of Z'ssss. 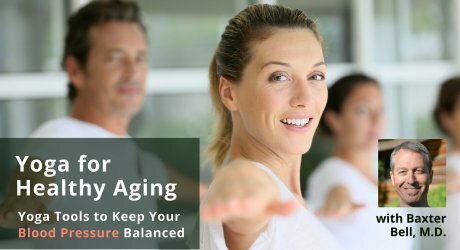 Need more tips for healthy aging? Study with Baxter Bell, MD, and YogaUOnline - Yoga for Healthy Aging: Yoga Tools to Help Keep Your Blood Pressure Balanced.